Omar Sharif, 27, is a Pride of Britain award winner and Ambassador for the Princes Trust. He grew up in central London and became involved in a gang when he was 14 years-old. Three of his friends died as a consequence of knife crime and Omar moved to a different part of the city, despite pressure from gang members, to start again. However, when the business he set up didn’t take off, he became homeless. Eventually, Omar decided it was time for bigger change and moved to Coventry. The Princes Trust helped Omar to find work and gave him a new sense of direction. Omar has now successfully been self-employed for four years and has made such an impact running his most recent business ‘Omar Inspires’. 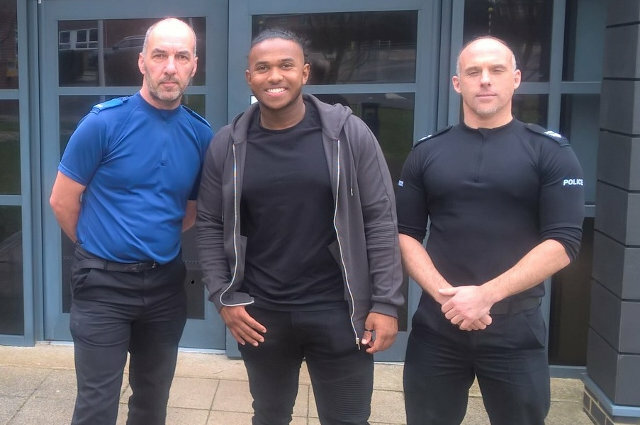 On Friday 15 March Omar joined officers from the Island’s Neighbourhood Policing Teams to speak about his experiences to more than 1,200 teenagers at: Ryde Academy, The Island Learning Centre in Newport, Cowes Enterprise College, and The Bay Church of England School in Sandown. Omar’s visit to the Island was organised by local officers and organisations from the Community Safety Partnership and was well received by children at each location. “It’s important for teenagers to understand the consequences of carrying a knife and that there is an alternative, even if they are feeling pressured by their peer group. For more information on the national campaign please visit the Website. 7 Comments on "Isle of Wight teens hear inspirational talk on knife crime by former gang member"
Really? Is this really necessary on the IW? ..and look at the irresponsible photograph in the County Press article ‘Become a ‘super kid’ at Isle of Wight self defence class’. Surely we are in danger of normalising and potentially glamorising this issue of knife crime to certain elements, when it really isn’t an issue on the island, unlike major urban cities on the Mainland. The only knife crime I’ve hear of recently is some middle aged woman stabbing her partner, whereas our Island youngsters on the island seem very level headed and responsible to me. How many youngsters in the last year have we hear about being patched up in St Mary’s having been attacked by a knife? How many deaths of youngsters from knife crime have there been on the island? I should also have added that I strongly believe prevention is better than cure. The Isle of Wight is not immune to what’s happening elsewhere, but with the right education, we can prevent it becoming as big a problem here as it has been in other parts of the UK (and world).